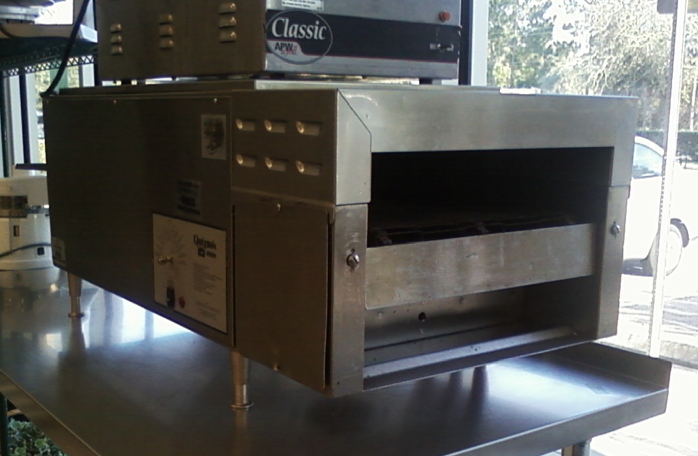 One Fat Frog Restaurant Equipment has a large variety of used and new conveyor ovens that are perfect for delis, bars, food trucks, etc. While all of One Fat Frog Restaurant Equipment’s stock of used commercial restaurant equipment comes with a 30 day parts and labor warranty, there’s still some maintenance that has to be done by the owner/employees on a conveyor oven. Here’s a look at some basic maintenance tips for a conveyor oven. Check the cooling fan operation daily and clean the cooling fan intake louvres using a stiff brush. Clean the oven exterior daily by wiping it down rather than spraying it, Also, clean the conveyor belt by using a stiff brush to remove any food debris. Lastly clean the crumb tray and guards daily with mild detergent. Weekly, clean the conveyor chamber. Many conveyor ovens have belt assemblies that can be easily removed from the unit, allowing you access to the insides to clean out debris that can build up on the belt’s frame. Also, once a week, inspect the conveyor belt links for damage such as severely bent or missing links that can stress the conveyor’s motors. If you’re in the market for a used or new conveyor oven, come into One Fat Frog Restaurant Equipment and check out the selection. One Fat Frog restaurant Equipment offers quick cash and package deals on the entire stock of used commercial restaurant equipment, including used and new conveyor ovens.